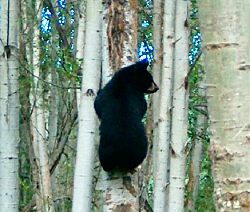 Round Lake Resort, a year round getaway in the Smithers, Telkwa, Houston area of Northern British Columbia, Canada. Round Lake Resort is 28 acres of beautiful forested lakeshore with boating, beach & nature trails. Our 5 fully furnished comfortable cabins have full bathrooms, full kitchens with cooking utensils and tableware, comfortable sitting room and either one or two bedrooms (1 or 3 beds) complete with quality bedding and linen. The cabins also have futons or hide-a-beds in the living areas to accommodate larger families or groups. 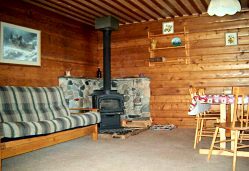 Wood fires and electric heat will ensure your comfort through all four seasons, and each cottage enjoys a covered deck with comfortable seating. 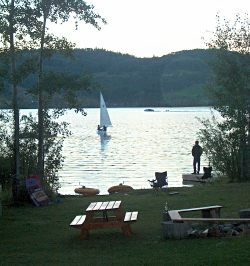 Some cottages even have extra parking for RVs to accommodate larger groups. 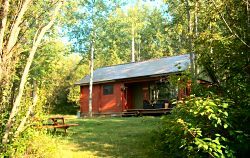 Round Lake Resort cabins are set apart to facilitate a romantic couple, vacationing families, or group get-togethers, all at the same time. Round Lake Resort offers many activities for you, Swimming, fishing, and lots to see while canoeing on the lake. For sailors, we have 2 sizes of sailboats as well. The beach area is sandy and it has a very gradual slope for the safety of younger children. For the young non-swimmers there's sandcastle building gear, and also a shaded playground. Our nature trails wind their way through 18 acres of meadow, forest, wildlife, wildflowers and changing scenery. Barbeques, toasting marshmallows, campfires, and bocce ball games are some of the many leisurely activities you can also enjoy during your stay at Round Lake Resort. In winter we maintain a large skating rink on the lake, a toboggan hill, and many guests use the lake or trails for x-country skiing. Ice fishing for trout on a beautiful sunny day, is really special, and can make for a tasty dinner! and everything in between. Using Round Lake Resort for your accommodations ensures quality holiday time and tranquility between your local adventures. Our guests confirm, "Adults leave rested, and kids leave for a rest"